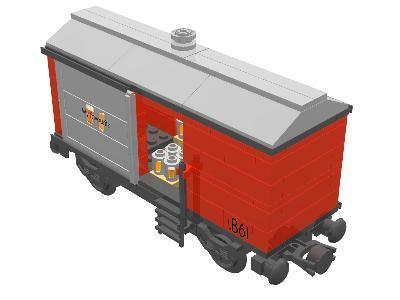 Red beverage wagon for beer- or softdrinkbarrels. Suitable for 9V, 12V or RC track. You can choose out of 24 different brands. Decals for the 2 sliding doors and the 12 barrels on pallets inside. Extra decals to use on your own models. Recommended brands: Amstel Bier, Budweiser, Coca Cola, Coca Cola Light, Coors Light, Jupiler, Stella Artois.